Liverpool's attack has won plaudits and the attention of Fantasy Premier League managers this season, but in Gameweek 18, their defence also came to the fore. Jurgen Klopp’s back four have conceded only two goals and the fewest shots (21) and shots on target (seven) over the last four Gameweeks, with the latest Dream Team line-up reflecting their progress. The Australian matched his season's best for saves in a single match, producing six stops in the stalemate with Burnley. Ryan has now delivered save points in six of his previous seven starts. The wing-back is finally producing attacking points to justify his hefty price tag. The Spaniard followed a midweek assist with the winner against Southampton, his second direct free-kick goal of the campaign. Only Philippe Coutinho (£9.0m), with seven, recorded more shots than Alonso's six in Gameweek 18. A first goal of 2017/18, coupled with a shutout at AFC Bournemouth earns Lovren his maiden Dream Team call-up. The Croatian has now picked up four clean sheets in his last six Gameweek starts. The left-back (pictured, top) has taken his opportunity to impress in the absence of the injured Alberto Moreno (£4.5m). 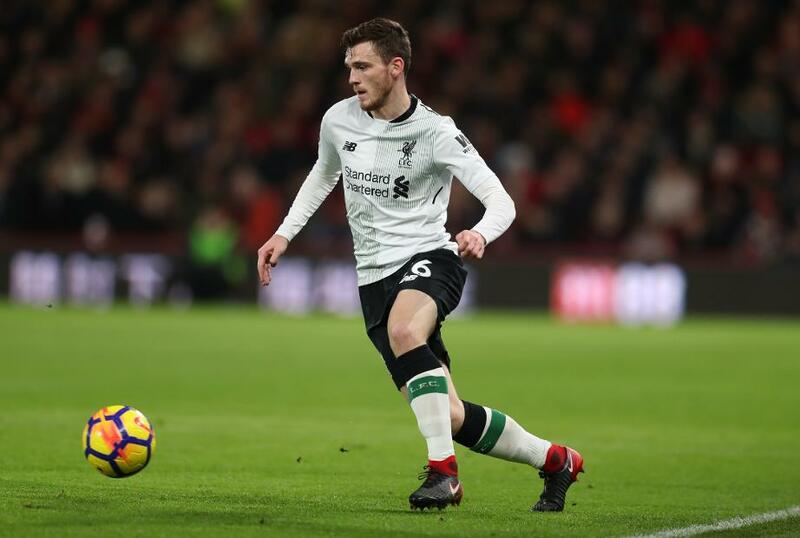 Robertson supplied an assist and a clean sheet to tally nine FPL points in Sunday’s victory over the Cherries. The midfielder moved to four goals for the season with a brace in the 4-1 victory at Watford. 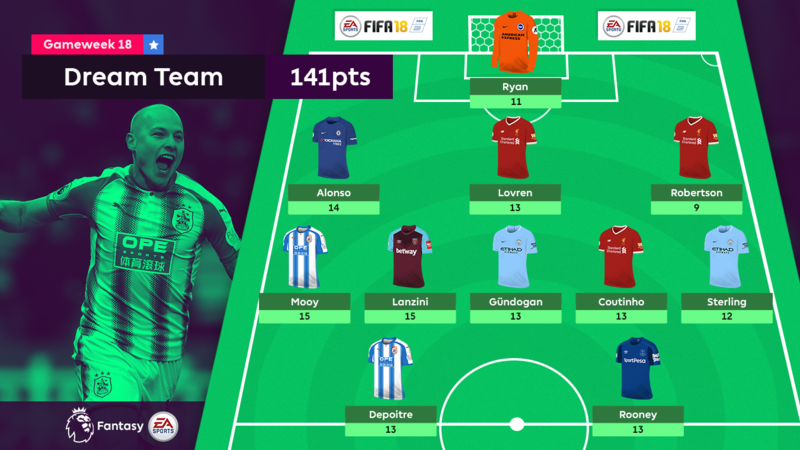 Last in the Dream Team back in Gameweek 2, Mooy remains a key figure for the Terriers thanks to his dominance of dead-ball situations and spot-kick duties. His 15 points constituted the joint-top individual tally in Gameweek 18. Matching Mooy’s total, Lanzini’s hat-trick of assists in a 3-0 win at Stoke City offers a reminder of his FPL potential. However, the Argentinian may now face a two-match suspension having been charged by The FA for deceiving an official for West Ham United's converted penalty. A second start of the season allowed the German to win Dream Team recognition with a goal and an assist in a 4-1 win over Tottenham Hotspur. A sustained run in Manchester City's midfield could allow Gundogan to emerge as a tempting cut-price option. A brace in the win over Spurs books a fourth Dream Team call-up for a player who has redefined his status as an FPL target. Shattering his season-best goal tally of nine, Sterling is Man City’s leading scorer on 11 and has started each of the last eight Gameweek, producing attacking points on five occasions. A 13-point haul at AFC Bournemouth marked Coutinho’s fifth double-figure score in only 10 Gameweek starts. That gives him an average of 7.3 points per match (ppm), a total that trails only team-mate Mohamed Salah (£10.0m and 7.5ppm) among FPL midfielders. The target man is showing form that can fend off the challenge of team-mate Steve Mounie (£5.7m) for his club's lone striker role. In his first start since Gameweek 15, Depoitre produced a goal and two assists at Watford, earning him 51,000+ new owners ahead of Gameweek 19. The striker maintained blossoming form with a goal and two assists in Everton's 3-1 victory over Swansea City on Monday night. Rooney has now supplied six goals and three assists from his last six Gameweeks and tops the FPL forward standings for points per million (12.1).